Wall's, the Unilever-owned ice-cream brand, has today launched a new brand positioning with the strapline "Goodbye Serious". Unilever said the new messaging is intended to give the brand a more relevant role in people’s lives again. The new positioning is supported by a new marketing campaign, created by Adam&EveDDB, its first in nearly a decade. The ads use a new, "cheeky" tone in a deliberate attempt to revitalise the brand’s image and appeal. 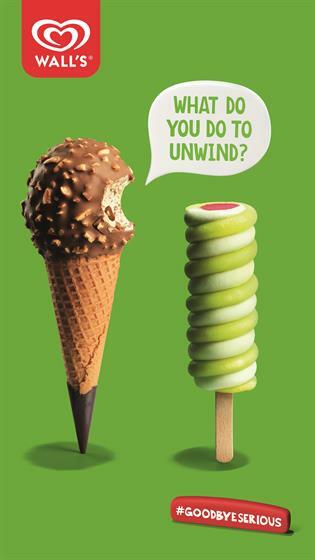 Examples include a Cornetto talking to a Twister, saying, "Do you want to unwind? ", and a Cornetto with its chocolate base broken off, saying: "I have a great bottom". TV ads will break this weekend, supported by outdoor, social and mobile activity. "Goodbye Serious" will be used across all the brand’s product lines, including Cornetto, Twister, Solero, Calippo and Funny Feet. 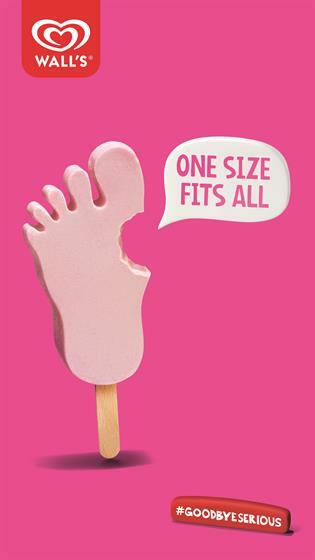 Jenny King, Wall’s brand manager at Unilever UK, said: "Everyone loves Wall's ice cream and with this new campaign we hope to give millions of Britton's the opportunity to take a break from the serious side of life this summer, for a few minutes anyway. "The highly contextual, multi channel campaign is a fresh approach for the brand and will drive real relevancy and cut through at every single consumer touch point."